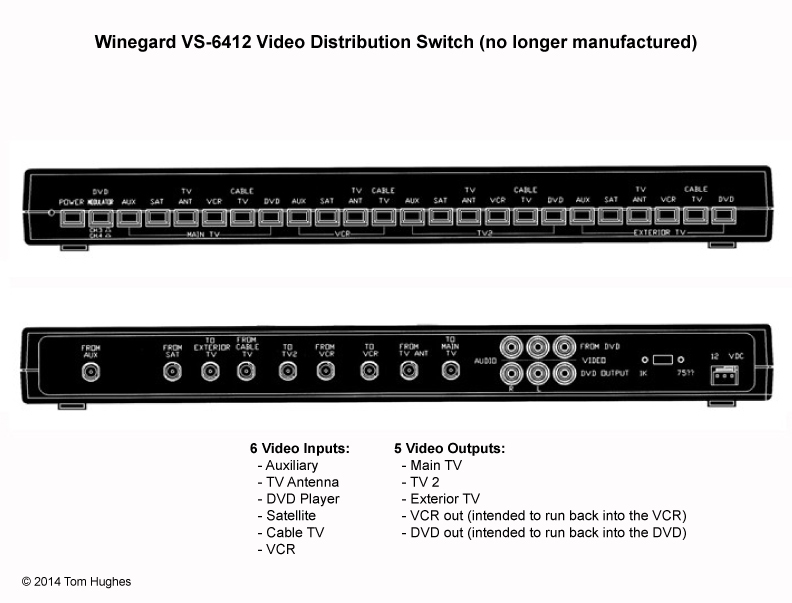 Video switches (or “BOMBs” = Box Of Many Buttons) like the discontinued Winegard VS-6412 and the current Quest Video Control Center are used in RVs to connect multiple video sources to multiple TVs. 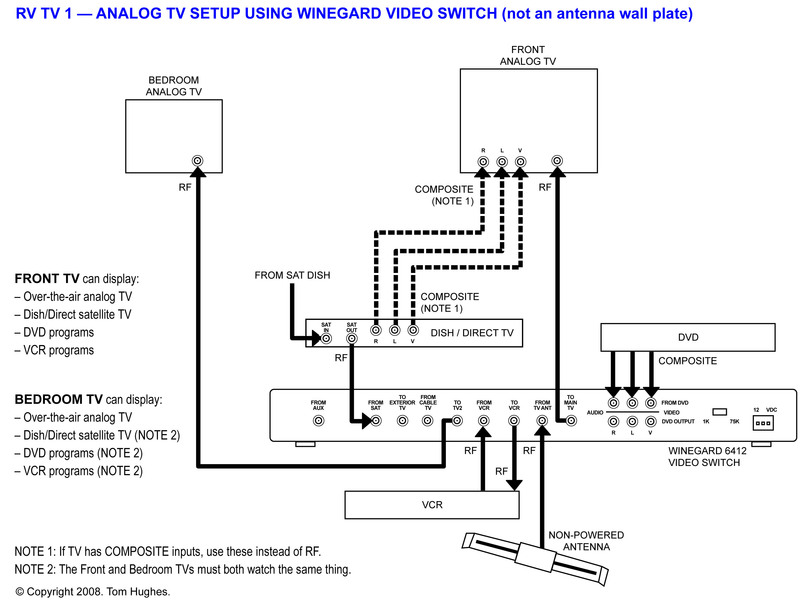 For example, the Winegard VS-6412 was able to distribute video from an OTA (Over The Air) “batwing” TV antenna, cable TV, DVD player, VCR, satellite TV, and another video source to three TVs. Here’s a link to the manual. These video switches used to be standard fare in RVs but have fallen our of favor because of their limitations. 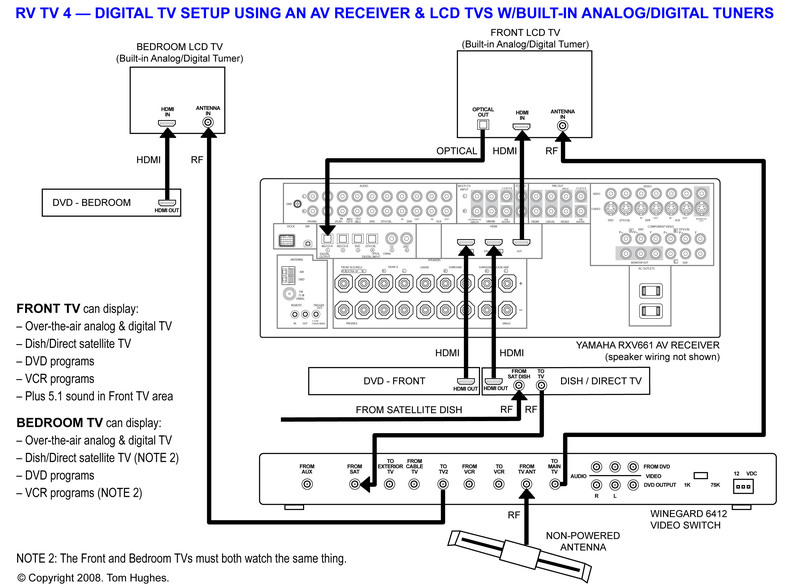 For example, SD (Standard Definition) devices like VCRs and non-BluRay DVD players are being replaced by HD (High Definition) devices like BluRay DVD players. Video switches have effectively been replaced by flat screen TVs. 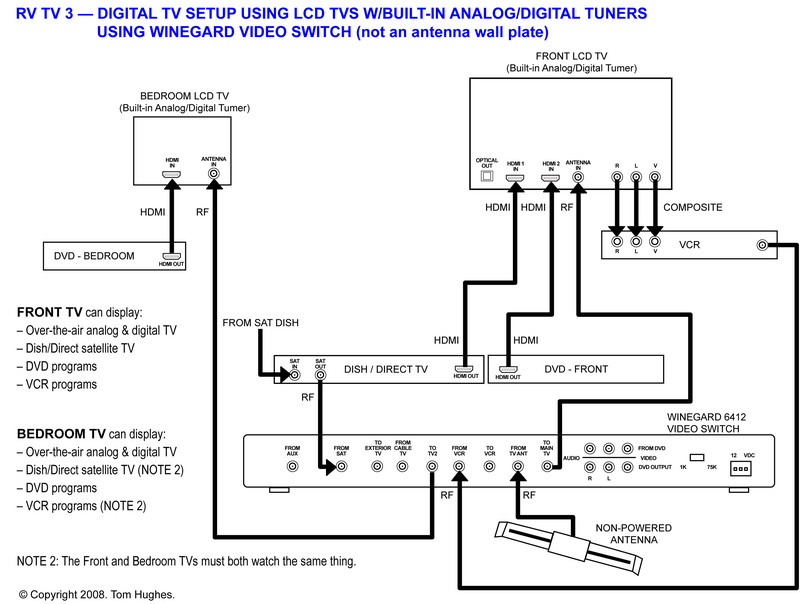 Flat screens (or digital TVs) usually have multiple video inputs (HDMI, component, composite, and RF), so the TV itself becomes the video switch. Video distribution capabilities have become less and less important as the cost of VCRs and DVD players have decreased. 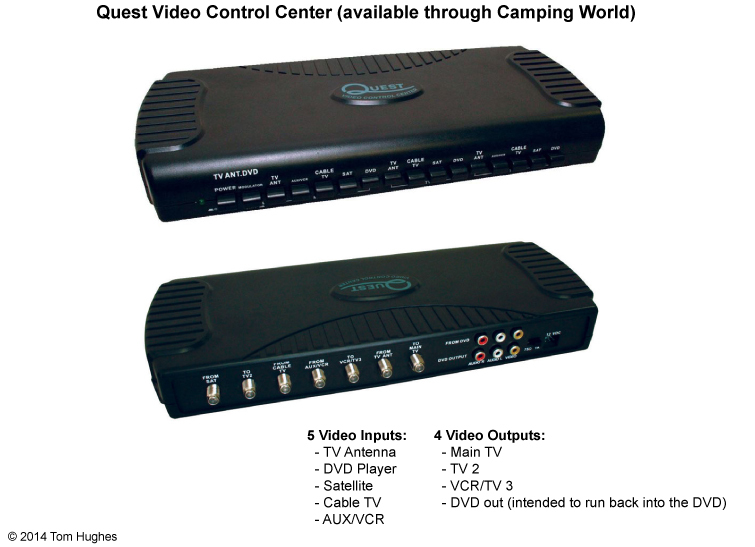 For example, instead of distributing the programming from a single DVD player to the TVs in an RV, separate DVD players can be purchased and connected to each TV. Plus, there was always the question of the “remote” . . . most remote controls are IR (Infrared) and in order to use them you must have a clear line of sight between a remote and the device. This can be problematic if you’re trying to control a living room VCR from the bedroom. 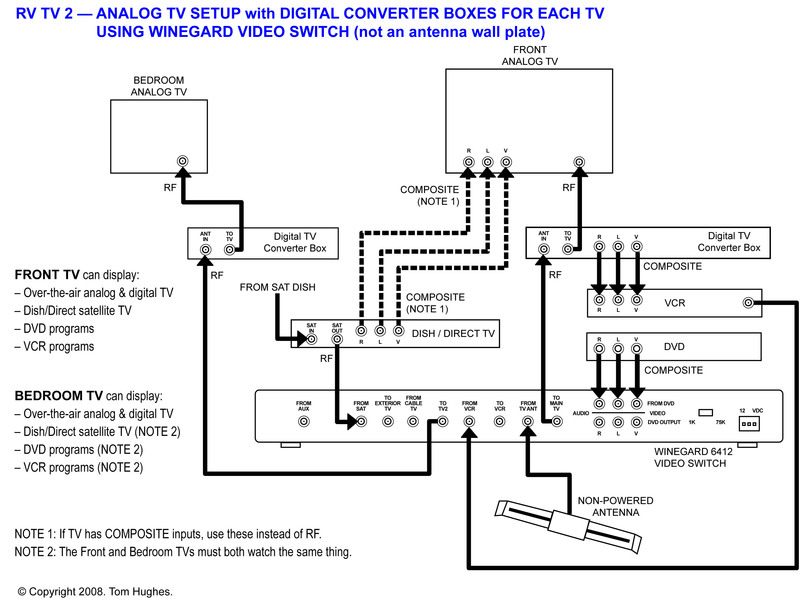 Video switches can still have a place in an RV, but with the advent of HD and surround sound, BOMBs are being replaced with AV receivers, MoCA (Multimedia over COax) devices from DISH and DirecTV, and wireless HDMI connectors. VERY helpful Took me forever to find it. Thank you. I have a distribution box for my tvs. There is no power switch or led to show it’s on. There is power 12volts to lead. I cannot get any tv stations using my antenna. In site next door they get 20 stations. I checked all co- ax connections. All good. Five days ago when we had cable at another camp ground,, all worked well. I think I looked at all the possibilities so I think it’s the amplifier. How does one test it ? There are soon many variables here . . . I wouldn’t hazard a guess.